There are two parts to the Badlands. A North and a South. The North is full of trails and has the infrastructure of a typical national park. The south is in the Pine Ridge Reservation, and there are no trails. The last Ghost Dance took place in a basin there, and you’re free to cut your way to it. There is a road called Sheep Mt. Rd. that ascends to the top of a bluff, which you can use to hike down into the Southern part of the Badlands. I spend a long part of the afternoon on top of Sheep Mt. I write a little, and there are tall grasses growing and I run my hands through them as I walk along the edge of the cliffs. I was told there are fossils visible, giant tortoise shells, if you know where to look. And that they dissolve in the weather, like the rest of the rock, because they are now rock. But I don’t know how to look, and I don’t find them. After I leave Sheep Mt. I head south, deeper into the Reservation. The change is immediate. There’s no cattle, and it’s either fallow grassland, or what looks like small scale hemp production. The land is hilly, remnants of the Badlands tracing it south, and then becoming lush. The buildings are few and far between. When I do see one it is either a small church, an abandoned church, or a double wide with 15-20 cars parked out front. 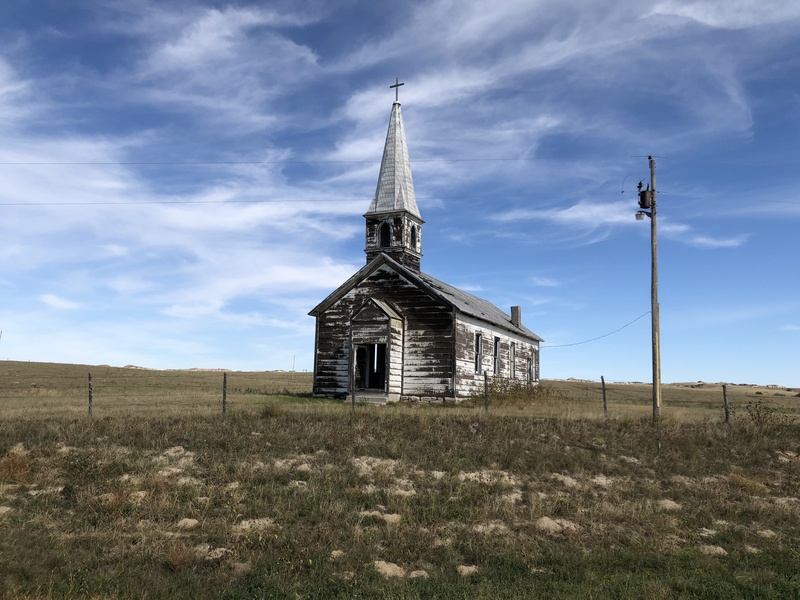 I pass through several small villages before entering Wounded Knee. The experience of Wounded Knee isn’t the Massacre site, but everything that surrounds it. There’s no exaggeration in saying it’s a surrealist nightmare. It looks like the tragedy just happened. The town of Wounded Knee is easily one of the most impoverished places I have ever been in my life (the only thing coming close are the new Amazonian cities in Peru). To then have to reconcile it’s existence inside the geographical United States is nearly impossible. The town is devoid of infrastructure outside of churches and a US Post Office with a large American Flag flying outside. The houses themselves are crumbling and the paint has peeled off. From what I can tell there are no stores: not a gas station or grocery store or restaurant. It’s not clear why it exists. There’s a level of discomfort that is so palatable that I keep moving despite wanting to examine it further. The spot of the Massacre is nondescript, lying in a large grassy plain. There’s a sign that explains what happened, and a small cemetery at the mass grave site on top of a neighboring hill. Two boarded up churches are near the grave site. I buy overpriced sage from children who walk with me through the graveyard. “What are you going to do when you grow up?” I ask. “The army,” they both say. The visitors center is a looted burnt-out husk of a building sitting below the graveyard. I walk down to it and peer inside. I can sense people behind me and back away from the entrance. I go back to my car, feeling alive and present, and not able to articulate why. Driving North-East through the Reservation things improve slightly. I pass the Oglala Lakota College and there are schools and some new building frames visible. I stop by Kyle to eat dinner at what I’ve been told is the only restaurant in the north of the county. Agriculture here seems more consistent, with large bails drying in the fields. It’s getting dark by the time I leave the reservation, and the distinctions as I enter Interior are not as pronounced as they were before. That night I tell someone I went into the reservation. They look shocked. “You drove that car into the reservation?” they ask. When I get to my room I look up the Pine Ridge Reservation: it is the poorest place in the US, the life expectancy is the lowest in the Western Hemisphere, unemployment is 80%, alcoholism is 80%, there is almost no industry. And then I look up the town of Wounded Knee and see that the average income of Wounded Knee is half that of the Pine Ridge Reservation. These are facts beyond my comprehension.